Today we feature an interview with David Sibbet, author of Visual Teams, a guide to using graphical tools to improve team cohesion, participation and performance. Sibbet’s work, done in conjunction with his partners at The Grove, is notable for creative types for a couple of reasons, including the emphasis on visual, as opposed to verbal, media to convey key ideas and concepts in workplace meetings, and for Sibbet’s patterning of some of his tools and processes after those used by two professions noted for their high creativity quotient: graphic design and architecture. David was gracious enough to also provide a copy of Visual Teams for me to study. After the interview, I provide a brief mini-review of this intriguing and ground-breaking book. Enjoy! How did the idea for Visual Teams develop? The term grew from writing Visual Meetings and thinking about what teams would look like if they could use these methods across the whole arc of their work. The concept of visualizing the Drexler/Sibbet Team Performance Model sprang from my work with Apple in the 1980’s and the growth of my own graphic facilitation practice. I became convinced that providing a graphical user interface for the core tools of group leadership would be as helpful as it was for computing. So the book is both about how teams can apply visualization productively, and how team leaders and participants can use graphics to understand team processes. What are some of the primary advantages for creative teams who use visual tools such as yours? Teams are supported in being able to keep the big picture in mind while working on details. This is the doorway to systems thinking. And everyone can remember insights, plans and agreements. A huge advantage of the Team Performance Model which is the central framework for the book, is having a common language about teaming that has been tested worldwide. In large organizations teams must work interdependently with other teams and gain support of the larger organization. Having visualizations of team vision, action plans, and other agreements help enormously in communicating to the larger organization. Graphics from visually facilitated meetings can also provide a useful storybook for review the process of a team with sponsors and bosses. In addition visual teams are probably going to a much more productive problem solvers when challenges arise. You pattern some of your tools and processes after those of design and architecture teams? Why? Both of these professions have well-developed processes for drawing out client interests and needs, developing responses, and then guiding the activity of implementation and construction. This kind of approach works for a wide variety of other challenges that are not necessarily problems of physical design. The loose kind of sketching and ideation that all designers use in early stages of a process as a way to think through problems is exactly like the kind of graphical work a management team would go through to make sense of a marketplace, competitors, or emerging technologies. In the design phases architects have well developed sets of templates and archetypal designs from which to draw, and spend time customizing and adapting as much as inventing from scratch. The same is true in strategy work, or process improvement work in business. And finally visual tools are irreplaceable for literally showing implementation teams what is required to manifest plans and ideas. 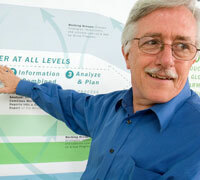 Graphics for action plans and roadmaps are essential to project management and large change processes. How can using these visual tools enhance business innovation? Innovation is all about seeing around corners and imagining new possibilities. The act of visualizing supports this kind of ideation. Sketching out possibilities and building on them as a group is a tried and true technique used by designers to embrace fresh thinking. Those of us who have been pioneering active visualization with groups and teams are fascinated that the idea of “design thinking” is finally getting very popular. Design thinking is, in simple terms, working like a designer or an architect. It’s a process of using creative media to represent ideas and prototypes of solutions. This amplifies the discovery learning process in a group. I’ve long called the graphic templates we use for Strategic Visioning a way of doing “conceptual prototyping.” These methods increase the chance that a group will honor and even develop brand new ideas and not stay confined to group think. To the extent that innovation needs to take place in business processes, it is nearly impossible to think through improvements without using displays of the process. Some 80 percent of the tools used in the total quality movement in the 1980s and 1990s (evolving into Six Sigma, scoreboard, and other tools), involve visualization for this reason. To “see” a process is to understand it. This doesn’t require drawing as much as representational display making with sticky notes and flow charts. 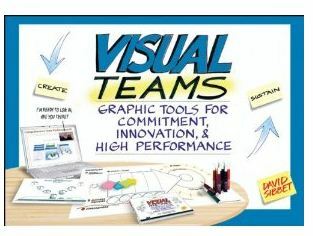 What are some of the most popular visual team tools from the book? Can you give us examples of how these tools are utilized in the workplace? The wide gamut of approaches described in Visual Meetings are the most accessible tools. These include using sticky notes, graphic facilitation, and idea mapping for making sense out of the factors and forces surrounding a team project, and for leading project update meetings and change rollouts. Visual templates, or what we at The Grove call Graphic Guides, help people who are visual but not skilled at drawing, to get the full power of visual display during any kind of planning activity. These are used all around the world for getting clear about 3-5 year strategies, and for doing the annual business planning required for implementation. Visual Teams also describes the many new technology tools that are allowing visualization to take place remotely. Virtual visualization is used most simply by providing target documents during teleconferences. If interaction is added, then teams can also do generative work. I would have to say that the most popular of all the tools is the Team Performance Model itself. It is one of the most robust and well-tested models available, and is a standard at companies like Nike, Genentech, Becton Dickinson, and Chevron Corporation. This model is used to think through how to support team startups, change processes, and team improvement processes. To “see” a process is to understand it. This doesn’t require drawing as much as representational display making with sticky notes and flow charts. What are the most frequent objections to using the tools mentioned in Visual Teams? How can they be overcome? Working visually with paper requires a bit of logistics in obtaining large paper, tape, markers, and then learning to take and process digital photos for distribution. On the surface it seems easier to create a PowerPoint and talk at people rather than drawing them out, in spite of the fact that this way of work is energetically quite “pushy” and not very effective at tapping group creativity and involvement. When it comes to working virtually, adding an interactive visual component again requires some learning about how to simple graphic frameworks and tablets on web conferences. While these tools are not difficult inherently, until a person has direct experience they can seem daunting. What are a couple of quick tips based on the book that you might give to a group of 2 or 3 people who are collaborating together on a creative project for the first time? • Appreciate that orienting to purpose, trusting each other, being clear about goals and committing to being one, collaborative team are fundamental to all further team success. • Establish a good foundation around being clear about expectations, purposes and goals. • Take the time for people to engage as people and learn about the skills and interests each is bringing to the team. • Appreciate that mutual commitments provide the constraints that support excellence in implementation. Is there anything else that’s relevant that you’d like to add? If a group can explore where it has shared experiences in the past that can provide channels of communication and understanding it can help a great deal with present challenges. A fun exercise is to ask a team to answer the question – “when we imagine being successful, we would be like a ______________ “ and have them identify another kind of team in sports, performing arts, or another area that would provide a metaphoric model. 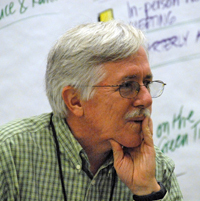 David Sibbet’s Visual Teams is a breath of fresh air in the world of team performance. While many teams in the corporate world go about their work drowning in words, but lacking in clear images for which to strive, Sibbet shows this is not the only way. This book builds on the visual tools for meetings he provided in his previous book, and expands the visual toolkit to include situations such as how to lead a visual team; how to collaborate using visual tools when your team is scattered across the country or globe; and how to use visual tools to manage projects and ensure high performance. For many creative people, Visual Teams will be an affirmation of how they think anyway, and will help others quantify or explain their team process in a way that helps improve it. If there is one criticism I have of this book, it is that it is perhaps best used when paired with Sibbet’s previous book, Visual Meetings. But since meetings and team performance are interrelated, this is a minor quibble. Both books are bursting with new ideas on how to represent commitments, input, information flows and many other items in a visual way that helps everyone engage with the material in a new way. I used David Sibbet’s tools and processes extensively at General Motors with the teams I worked with. Despite some initial hesitation when I would suggest using one of the visual tools in a planning or visioning intervention, the teams always responded enthusiastically once they got into the process. They had robust outcomes versus using more traditional methods or no methods at all.